Usually, the AD Based Routing comes to mind when replacing a traditional PBX with Skype for Business. There will be a time where both platforms will run side-by-side and there should be seamless call routing between two systems, as users will be homed in both the side. Ideally, the gateway will be deployed “Upstream” to the PBX and Mediation Server and the task is to find a easier way to route calls to migrated uses in Skype for Business. If it’s just handful of users, static route can be configured based on the destination number in the gateway, to route calls to Skype for Business based users. But, this involves configuration in the gateway and usually, a person with required AudioCodes knowledge will need to involve and do the configuration. But, with AD Based Routing, end customer can move users in to Skype for Business by just setting the Line URI for the user and no change in the Gateway will be needed to route calls to Skype for Business. As soon as the Line URI is set, the inbound PSTN calls will get routed to Skype for Business. Mediant Gateway will use LDAP to look at the msRTCSIP-Line attribute for the user configured in AD, and try to match the inbound number with the configured value. If it find a match, based on the routing configuration, calls will be routed to the mediation Server. If no match found, it will fall back to the next route available, which is configured to send calls to the PBX. 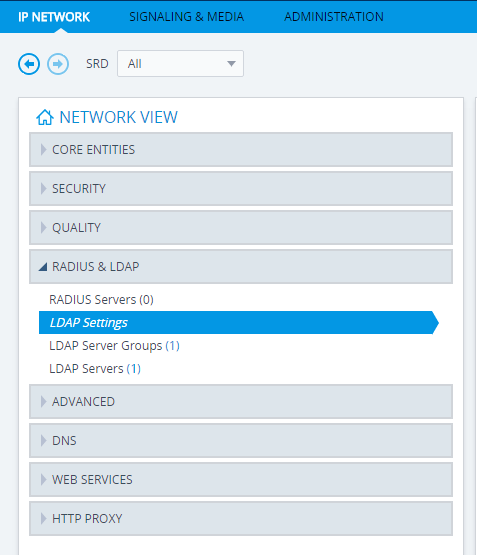 Configure LDAP server and base DN for look up. The LDAP related configuration is located in IP Network component. By default, LDAP services is set as disabled. This need to be enabled. Go to LDAP Settings and enable LDAP Service. Once enabled the setting, the gateway need to be restarted to apply the configuration. Go to LDAP Server Groups and set “Server Search Method” as Sequential and “DN Search Method” as Parallel. The “LDAP Server Search Based DNs“, add the base DN as shown below. Next step is to configure “Call Setup Rules”. This can be found in “SIP Definitions” section in the configuration. In total, there are 7 rules that need to be configured. The purpose of those rules are, to normalize the inbound destination ID to match with the Line URI, Match the destination number with the msRTCSip-Line attribute value, Normalize the Calling ID presentation. Note that the below example rules have +618 added as a prefix. This will be different in each country and also, based on the Telco provider. Check the source and destination number format offered by the Telco provider, before configuring the rules. Configure the rules as shown below, in mentioned order. Only change the prefix, based on the number presentation. Now, the rules are configured for AD lookups. But, the route is still not set to use these rules for call routing purpose. To enable this in the route, edit the route that’s configured to send calls from PSTN to Skype for Business. In “Advance”, “Call Setup Rule ID Set”, set the ID as 1. So looking at how the routing will function, an inbound call from PSTN will go through the AD base lookup to find if there’s any telephone number configured in msRTCSip-Line attribute, if any found, it will route the call to the destination set in the route, which is the Skype for Business Mediation Server. If no match found, the it will fall back to the secondary route which is set to route calls to PBX. Give it a go and if there’s any issues, please post in the comments below. Thanks.